کریمی, فرید, روشندل کاهو, امین. (773). تضعیف نوفه‌های تصادفی داده‌های لرزه‌ای با استفاده از فیلتر میانگین غیرمحلی. 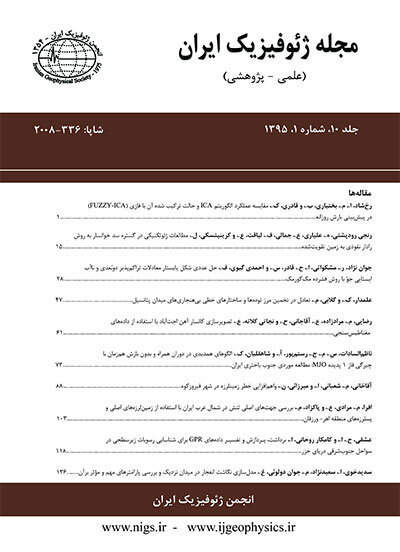 مجله ژئوفیزیک ایران, 7(4), 1-10. فرید کریمی; امین روشندل کاهو. "تضعیف نوفه‌های تصادفی داده‌های لرزه‌ای با استفاده از فیلتر میانگین غیرمحلی". مجله ژئوفیزیک ایران, 7, 4, 773, 1-10. کریمی, فرید, روشندل کاهو, امین. (773). 'تضعیف نوفه‌های تصادفی داده‌های لرزه‌ای با استفاده از فیلتر میانگین غیرمحلی', مجله ژئوفیزیک ایران, 7(4), pp. 1-10. کریمی, فرید, روشندل کاهو, امین. تضعیف نوفه‌های تصادفی داده‌های لرزه‌ای با استفاده از فیلتر میانگین غیرمحلی. مجله ژئوفیزیک ایران, 773; 7(4): 1-10. داده‏های لرزه‏ای خام همواره شامل انرژی‏های ناخواسته هستند. از این انرژی‏های ناخواسته و نامطلوب در لرزه‏شناسی با عنوان نوفه یاد می‏شود. تضعیف نوفه تصادفی یکی از مراحل مهم در پردازش داده‌های لرزه‌ای است که تاثیر بسزایی در تعبیر و تفسیر داده‌ها دارد. تابه‌حال روش‌های گوناگونی برای تضعیف نوفه تصادفی عرضه شده است که هرکدام مزایا و معایب مربوط به خود را دارد. در این مقاله از فیلتر میانگین غیرمحلی که به‌‌منظور تضعیف نوفه از تصاویر در فن پردازش تصویر توسعه یافته است، برای تضعیف نوفه‌های تصادفی در داده‌های لرزه‌ای استفاده می‌شود. این الگوریتم مقدار تضعیف نوفه هر پیکسل داخل تصویر را با استفاده از نمونه‌ها یا پیکسل‌های مشابه آن، بدون در نظر گرفتن موقعیت آنها نسبت به یکدیگر تعیین می‌کند. در واقع این الگوریتم، یک فرایند غیرمحلی است. نتایج به‌دست آمده در مقایسه با دو روش متداول فیلتر میانگین و فیلتر میانه که به‌صورت محلی عمل می‌کنند، حاکی از برتری روش فیلتر میانگین غیرمحلی در تضعیف نوفه‌های تصادفی در داده‌های لرزه‌ای است. The reliability of seismic mapping is strongly dependent upon the quality of the records. Seismic records are usually affected by various types of noise such as ground rolls, multiples, random noise, reflection and reflected refraction from near surface structures, and so on. Random noise resulted from random oscillation during acquiring data is one of the most important and harmful noises that exist in seismic data over entire time and frequency. Random noise attenuation is an important step in seismic data processing affecting the data interpretation. Many efforts have been made to remove this type of noise from the seismic data. The predictive filter is an ordinary method commonly used for random noise attenuation from seismic data. This filter can be used in various domains, such as the f-x domain (Haris and White, 1997) and the discrete cosine domain (Lu and Liu, 2007). Jones and Levy (1987) removed events which were not coherent trace-to-trace events by means of the Karhunen-Loeve transform. Karsli et al. (1996) applied complex trace analysis to seismic data to suppress random noise and improve the temporal resolution of the data. Terickett (2008) attenuated the random noise from the seismic data by Cadzow filtering of a constant frequency slice in an f-xy domain. Bekara and Baan (2008) attacked the random noise problem using the empirical mode decomposition technique. In this study, we used non-local means filtering (Buades et al., 2005) developed for image denoising for random noise suppression in seismic data. In this method, a seismic record can be considered as an image. The non-local means method is based on the assumption that the image content is likely to repeat itself within some neighborhood. The neighborhood of a pixel is generally chosen to be a square with a dimension size of three to nine centered upon the pixel of interest. However, the size and shape of the neighborhood can vary. In this method, for each pixel with a neighborhood , the pixels with the neighborhoods similar to that of the interest pixel are found. The denoised value of a pixel is determined by a weighted average of all the pixels in the image. The weight of each pixel can be calculated by the similarity between the two pixels and computed using the Gaussian weighted Euclidean distance between the neighborhood around the pixel and the neighborhood around the pixel .To investigate the efficiency of the proposed method, we tested the non-local means algorithm on both synthetic and real seismic data. We also compared the obtained results by that of the traditional mean and median algorithm for seismic data denoising. To investigate further, we applied the three denoising methods to synthetic seismic data with different amounts of signal-to-noise ratios. After analyzing all of the results, the non-local means algorithm proved to be a better algorithm for seismic data denoising and had the best performance among the three methods. صادقی، م.، 1391، بهبود تفسیر داده‌های لرزه‌ای با استفاده از تلفیق روش‌های آنالیز مولفه اصلی و تجزیه طیفی، پایان‌نامه کارشناسی ارشد، دانشکده معدن، نفت و ژئوفیزیک، دانشگاه صنعتی شاهرود. Bekara, M., and Bann, M., 2008, Random and coherent noise attenuation by empirical mode decomposition, 78th SEG meeting, Las Vegas, Expanded Abstract, 2591-2595. Bonar, D., Sacchi ,M., 2012, Denoising seismic data using the nonlocal means algorithm: Geophysics, 77, A5-A8. Buades, A., Coll, B., and Morel, J. M., 2005, A review of image denoising algorithms, with a new one: Multiscale Modeling and Simulation, 4, 490–530. Buades, A., Coll, B., and Morel, J. M., 2010, Image denoising methods. A new nonlocal principle: SIAM Review, 52, 113–147. Dangeti, S., Denoising Techniques – A Comparision, 2003, M. Sc. thesis, The Department of Electrical and Computer Engineering, Louisiana State University. Efros, A., and Leung, T., 1999, Texture synthesis by non-parametric sampling, 7th IEEE International Conference on Computer Vision, Kerkyra, 2, 1033–1038. Haris, P. E., and White, R. E., 1997, Improving the performance f-x prediction filtering at low signal-to-noise ratio: Geophysical Prospecting, 45, 269-302. Jones, I. F., and Levy, S., 1987, Signal-to-noise ratio enhancement in multichannel seismic data via the Karhunen-Loeve transform: Geophysical Prospecting, 35, 12-32. Karsli, H., Dondurur, D., and Cifci, G., 2006, Application of complex-trace analysis to seismic data for random-noise suppression and temporal resolution improvement: Geophysics, 71, V79-V86. Lu, W., 2006, Adaptive noise attenuation of seismic images based on singular value decomposition and texture direction detection: J. Geophys. Eng., 3, 28-34. Lu, w., and Liu, J. L., 2007, Random noise suppression based on discrete cosine transform, 77th SEG meeting, San Antonio, Expanded Abstract, 2668-2672. Mallat, S., 2009, A wavelet tour of signal processing, Elsevier. Sarker, S., Chowdhury, S., Laha, S., and Dey, D., 2012, Use of non-local means filtering to denoise image corrupted by salt and pepper noise: Signal & Image Processing: An International Journal (SIPIJ), 3, 223-235. Sheriff, R. E., and Geldart, L. P., 1995, Exploration Seismology, 2nd edition, Cambridge University Press. Trickett, S., 2008, F-xy Cadzow noise suppression, 78th SEG meeting, Las Vegas, Expanded Abstract, 2586-2590. Umbaugh, S. E., 1998, Computer Vision and Image Processing, Prentice Hall. Yilmaz, O., 2001, Seismic data analysis: processing, inversion and interpretation, SEG.